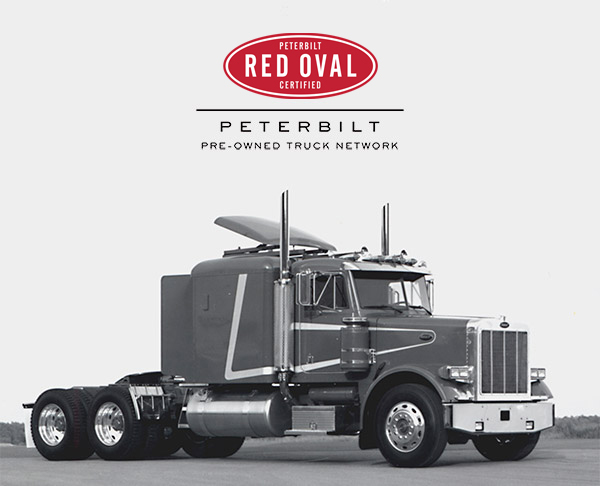 Red Oval Certified is Peterbilt's certified pre-owned truck program. Every Red Oval truck passes a comprehensive 150 point, factory-certified inspection ensuring peak performance from the moment of delivery. Red Oval Certified provides the confidence you deserve for the long haul. Peterbilt Class 8 Models equipped with the PACCAR MX Engine are protected by the PACCAR Engines Pre-Owned Warranty. Our Red Oval Certified inventory is 4 model years or newer with less than 450,000 miles and pass DOT certification. Since 1939, Peterbilt has consistently set new standards for quality, reliability, performance and innovation. Our dedicated focus on serving the full range of customer needs and providing industry-leading satisfaction extends well beyond the sale of a new truck. Peterbilt and its dealer network support customers through exceptional service, parts sales, financing, leasing and rental, and advanced technologies, such as our SmartLINQ remote diagnostics system. Red Oval Certified trucks have been a part of Peterbilt's proud heritage for more than 20 years – setting higher standards for what customers expect when purchasing used trucks. Peterbilt recently enhanced the Red Oval Certified brand with more comprehensive inspection checks, increased certification criteria, expanded warranty coverage, and customer loyalty discounts. Today, you can purchase a Red Oval Certified truck with ease knowing your truck is the next best thing to new. Call or visit your nearest Peterbilt dealership for more details and pricing. Every Red Oval Certified truck must pass a comprehensive 150 point, factory-certified inspection performed by a Peterbilt master service technician. The Red Oval Inspection includes full DPF cleaning, oil and filter change, front-to-rear evaluation and reconditioning services. Our Red Oval Inspection ensures all interior and exterior parts have been properly serviced and repaired. And our 90-day Buyer's Assurance is our commitment to deliver exceptional products with long-lasting uptime. Call or visit your nearest Peterbilt dealership for Red Oval Inspection requirements.